The Basic Kanban Canvas is a tool for organizing and visualizing projects, asigning To-Dos in the team and structuring the project development. A typical task-list for teamwork in a new, optimized online version. If you want to try it out without entering your email address, please use our public Kanban Demo Canvas for a first impression. Try out the sneak preview of Canvanizer 2.0! 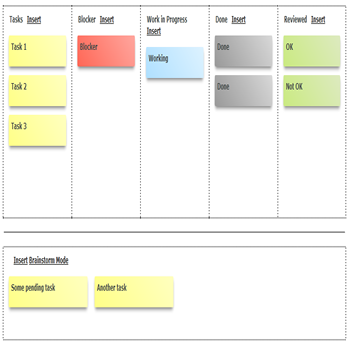 Kanban Canvas is a simple but effective way to manage tasks. Kanban is a great way to assign tasks as well as visualize the current project status on one simple sheet. So a Kanban Canvas gives you the complete progress view of all the tasks to do, currently worked on or already finished and reviewed. Tasks: These are actually “need to do” tasks or “pending tasks”, – your backlog should be placed here in this section. Blocker: Blockers are tasks that cannot be finished or have dependencies that prevent other tasks from getting finished. Work in Progress: Tasks currently worked on are all listed in this section. You can choose either multiple tasks at the same time or single task at the same time; it’s up to you and your business process. E.g. you can enforce a work-in-progress-limit of one ticket at a time per team member. But all the tasks listed in this section mean you or someone else is carrying it out until finished. Done: When a task is finished, it should be moved to the Done section for verification or testing. Done tasks also mean accomplished tasks to the workers, but it’s not completely through the chain yet. Maybe they need to be forwarded to testers or quality assurance staff. Reviewed: Once a finished task is verified and passed the test it is moved here. Actually, not all Done tasks are moved to Reviewed section. Done tasks maybe move back to Tasks section or Blocker section if they aren’t met expected quality. To get started with Kanban Canvas, we recommend you to use Brainstorming section to list all your tasks: both possibilities and blockers; all pending, doing or done tasks you may have and then after switch back to main canvas we can re-organize them into the right place and start from there. Also another tip: Break your tasks down in small, max 4h per task units and include task specific.